So again, I'm blogging about the past. There was a lot that happened in the month of July that I just never got around to blogging about. July was a VERY busy month and we did a lot of fun stuff. I did get a blog in about our 4th of July...Fantasy Lake and the Hope Mills Fireworks. I also blogged about our day at Jungle Rapids in Wilmington with Grandma(Sharon). There was some other stuff that we did too. Jason and the kids watching the game. A family pic before we headed home. Jason and Maddie in a simulator of a Roller Coaster. Maddie riding on her beautiful white stallion. And now Jonas' turn. He loved this ride. The two partners in crime...driving in a monster truck!! While we were in CLT , a friend of my Dad gave us his old wooden swing set. Now when I say old, I just mean his old one b/c he got a new (bigger) one. It isn't old. It's in great shape. We are excited about it. But of course b/c we are in an apt right now, we left it at my parents house. When we have a house and a yard to put it in then we will get it but until then, the kids will have something to do at Grandad and GiGi's house. I know that this is pretty crazy but just for my own future use and a reference... I'm going back a few months and posting some pictures and blog about some things that I missed about the month of June. Here's a picture of Jason(&Maddie) on his new bike. He has entered into a Triathlon that is scheduled for Aug. 28th. For Jason to do so, he needed a bike. Participating in a triathlon is one of Jason's life goals so he has been working/training really hard for it. He found this Trek 720 on Craigslist and got a great deal on it and it's in great condition. Maddie likes to ride around the parking lot with him. She just grabs her a stool cushion and hops on. In this picture, Jason and her are sharing iPod earphones and riding. What a cute pair!!! Here's just another picture I threw in b/c they were being so cute. They were sitting on Maddie's bed and she had a book that she was "reading" to Jonas. She did a great job making up a story to follow the pictures in the book. She's a creative little girl. And hey, it had to be pretty interesting for it to keep Jonas still for 2 seconds or more. :o) OHHH I love my babies!!! The first here is the one that we have hanging up on the wall, along side Jonas' 1 yr pic. 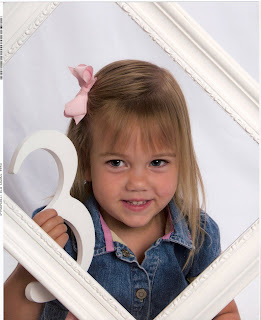 This picture just makes me want to cry b/c she looks so grown-up. But I think she looks so sweet and beautiful, too. This is the real Maddie. She loves books!! 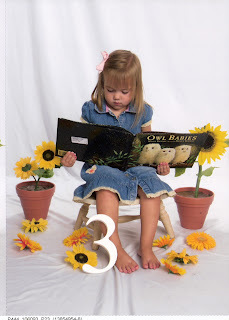 This book is also a special one b/c her favorite animal is the owl. We had checked this book out so many times at the library that I finally just decided to buy it. 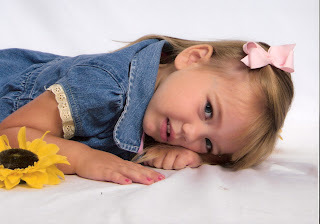 But this picture will always be special b/c it shows the real Maddie and what she liked at age 3. Now here are the pictures of the kids together. I thought these pictures were so cute b/c it captured them. The first picture was totally random. I told Maddie to make Jonas smile and she just does what she always does and she got up in his face and just stares...and he laughs. It wasn't meant to be like this but she took the picture anyway and it's one of my faves b/c again..."it's them". This is what they are like everyday of the week. The second picture is of them reading books together. We read a lot of books in this house so I just like to have pictures that capture who we are. Since we still had some time the lady took a few of Joey, as well. 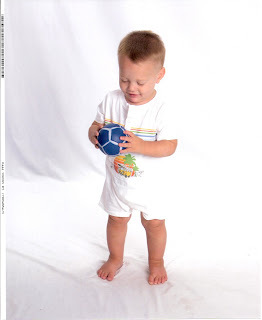 Here's Jonas with one of his favorite toys...a ball that lights up. In this picture he is actually turning the ball around to find the button to turn the blinky light on. It's his favorite ball. Second picture is just a funny one of Joey. I didn't really like this one but Jason did. I mean it is funny but, well...idk. It's Jonas doing his belly laugh. So now do you know?? Yes, baby powder!! EVERYWHERE!!! Of course, you can probably see that Jonas was the victim here. He was covered. I couldn't even see his scalp b/c there was like 5 layers of powder on his head. It was all over the room. OH what a mess to clean up. After I calmed down I had Maddie go in and clean as much as she could and then I did my best to vacuum it up and dust things off. So this has been my morning and all that was done before 8 am. All I have left to say is...CALGON, TAKE ME AWAY!!!!!! What a birthday gift he (Jason) got!!! well here it is, check it out!! This is Jason's very first picture on his very first bike. Taking a ride around the neighborhood. Maddie sitting on it with Daddy. No she didn't ride it, none of us have. She was only sitting.